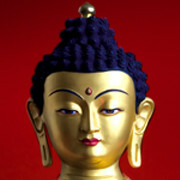 In Buddhism, meditation means "effortlessly remaining in what is." This state may be brought about by calming and holding the mind, by realizing compassion and wisdom, or by working with the body's energy channels and meditating on Buddha forms of light and energy. The most effective method is the constant identification with one's own Buddha nature, and the experience of always being in a Pure Land, both of which are taught in the Diamond Way. When the oneness of the seer, what is seen, and the act of seeing is unbroken - during and between the times of meditation -the goal of the Great Seal (skt. Mahamudra) is reached.